Is It Time to Flush Your Water Heater? If there’s any part of your HVAC system that’s consistently forgotten about—aside from the air filter—it would have to be the duct system. Yet, the ducts provide one of the most essential functions of the entire HVAC system: they circulate the air through your home! Likewise, those ducts need just as much professional attention as any other part of your HVAC system. And we really do mean a professional! In this post, we’ll explain why you need duct services from an expert of HVAC and energy savings in Deptford Township. The ducts are a big pathway for transporting air through the home, sort of like how our circulatory system transports blood through the body. And much like those blood vessels, getting a hole in them will cause big problems. As the ductwork ages, leaks can form around the seals connecting each piece of it. Holes can also form simply from the duct material degrading. Leaks are estimated to waste up to 30% of your air supply—you can see how this would be a huge problem when you’re blasting warm air through it in the winter. You might think we’re joking with this one. Why would duct tape be bad for ducts when it’s called duct tape? In truth, a test of several duct sealants proved that all of them worked quite well—except for duct tape, which failed horribly. We don’t blame anyone for thinking duct tape would be sufficient, but it just won’t cut it. Instead, professionals use sealants like Aeroseal to clog up all the leaks. Rather than using something like an adhesive, Aeroseal is delivered as a mist of particles through a pressurized duct system. The particles then cling to the leaks. This process is more precise than hunting down the leaks and sealing them manually. The average six-room home is estimated to collect 40 pounds of dust annually. Some of that will end up getting into your ductwork. The difference, however, is that you can’t clean out your ductwork as easily as you would dust off a shelf. Dirty ducts will lower your indoor air quality by spreading dust around your home, and some of that dust can even interfere with your furnace or AC, leading to repair problems. As tempting as it may sound, shoving a duster or vacuum hose into the vents is not going to be enough. In fact, these methods can actually make the problem worse by loosening up dust and debris. Not to mention that cleaning areas of the duct deep in the system will not be possible to reach on your own. 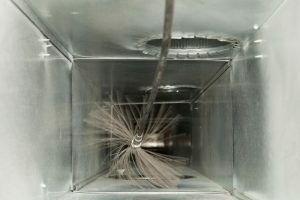 HVAC contractors have specific tools just for cleaning ducts. Not only that, but they have the experience and skill to use them properly. They’ll also be able to perform tests to make sure the job is done well (and while they’re at it, they’ll be able to test the ductwork for leaks). Need duct services? Don’t hesitate to call in a pro! Contact SPS Mechanical Inc. today.